Ousted dictator Saddam Hussein returned to court today and accused the new Shi’ite-run Interior Ministry of killing and torturing thousands of Iraqis, in comments likely to aggravate sectarian tensions. Sunni Arabs, who were dominant during Saddam’s rule, accuse the Ministry of running death squads and Saddam said it was now the “side that kills thousands in the street and tortures them”. Thousands of Indonesians rallied across the world’s fourth most-populous country today to protest against a parliamentary move to revise employment laws. In a major crackdown ahead of tomorrow's anti-King general strike by Opposition parties, the police today arrested some 40 protesters from the Nepalese capital and took into custody several political leaders after raiding their houses. Carrying placards with slogans of Indo-Pak friendship, thousands of Pakistani schoolchildren who received the world’s “largest love letter” with messages of peace and harmony from their Indian peers reciprocated the gesture by signing its golden strip. China is willing to consider allowing Tibetan spiritual leader, the Dalai Lama, to visit the country for the first time since 1959 if he sincerely abandons his pursuit for ‘independence’, a senior Chinese official has said. Pakistan, facing a shortage of around one million tonnes of sugar, has received an Indian offer to barter wheat for the sweetener, a senior government official said yesterday. Three shipyards workers, including an Indian national, were killed when the boom of a 100-metre- long crane collapsed while trying to lift a 185-tonne load at a Singapore shipyard yesterday. Dutch prosecutors concluded today that former Yugoslav President Slobodan Milosevic died of natural causes and was not murdered, countering allegations by his family that he was killed while in UN custody. Former Iraqi President Saddam Hussein reacts during cross-examination at his trial in Baghdad's Green Zone on Wednesday. Ousted dictator Saddam Hussein returned to court today and accused the new Shi’ite-run Interior Ministry of killing and torturing thousands of Iraqis, in comments likely to aggravate sectarian tensions. Sunni Arabs, who were dominant during Saddam’s rule, accuse the Ministry of running death squads and Saddam said it was now the “side that kills thousands in the street and tortures them”. The trial was adjourned later until tomorrow. Saddam, who could face death by hanging, remained defiant one day after the court announced he would face new charges of genocide against the ethnic Kurds in the late 1980s. Saddam may be in the dock again for another trial as early as next month, potentially leading to a drawnout, complex legal process in a country where most people want closure on a bloody past and a future free of sectarian bloodshed. Iraqi politicians and court officials are already sending mixed signals on whether he would be executed if found guilty in one trial, or be tried on new charges in another first. And the latest outbursts suggested chances of accelerating proceedings were slim. Chief judge Raouf Abdel Rahman and one of Saddam’s lawyers, Bushra Khalil, had several heated exchanges which resulted in her being thrown out of court. Guards escorted her out after she held up what appeared to be a picture of a pile of prisoners at the US-run Abu Ghraib prison, scene of a prisoner abuse scandal in 2004. “This is what the Americans did to Iraqis in Abu Ghraib,” said the Lebanese lawyer who was told to stop screaming. 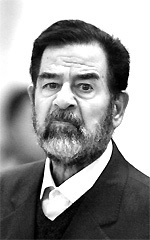 Saddam, who still calls himself the president of Iraq, also challenged chief prosecutor Jaafar al-Moussawi, a member of the Shi’ite Muslim community Saddam is accused of torturing and putting in mass graves. Employers have complained that Indonesia’s 2003 labour Bill gave workers so many benefits and so much freedom to organise and strike that it dealt a blow to the country’s economic competitiveness and its attractiveness to investors. The 2003 Bill was a product of the country’s first democratic Parliament after the 1998 fall of autocratic President Suharto. Suharto had kept unions on a tight leash, but the business community says the new law went too far the other way. The current Parliament, elected in 2004, plans to amend the Bill to give employers more flexibility, curb strikes and soften regulations on severance payment for dismissed workers. Trade unions argue revisions ignore the plight of workers and have vowed to keep protesting to pressure Parliament into leaving the law unchanged. Today, around 10,000 workers marched on major streets in Jakarta, creating traffic congestion and blocking the Capital’s special lanes for public transport. The protesters also passed out pamphlets saying the revisions could allow “employers to fire workers without reason”. The march stopped in front of Vice-President Jusuf Kalla’s office and a small group of protesters was allowed to meet him. President Susilo Bambang Yudhoyono was on a trip outside Jakarta. “We want to find a good solution for the workers and the business world in Indonesia. We do not intend to pressure the workers and make their lives difficult,” Mr Kalla told reporters after the meeting. But rally leaders were not satisfied with their meeting. “There has been no firm statement. We will only say we are satisfied if the government pulls back the proposed revisions,” said Mr Abdul Gani, a union leader from the industrial city of Tangerang. Police baton charged and arrested at least 40 journalists, human rights activists, doctors and university students who took out a rally in Kathmandu defying the Royal government's ban orders on demonstrations on the eve of the massive protests and four-day general strike announced by the Seven Party Alliance (SPA) to end King Gyanendra's rule. 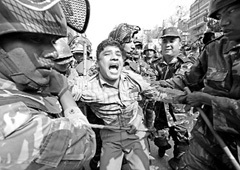 As soon as hundreds of journalists and civil society activists rallied in Nayabaneshwor area of the capital, the police intervened and made the arrests. A senior journalist and a lawyer were also injured in the police action, a member of the Federation of Nepalese Journalists (FNJ) said. Those arrested from the rally, organised by the People's Alliance for Peace and Democracy (PAPAD), include the Nepal Bar Association president and the PAPAD chairman, Mr Sambhu Thapa, the FNJ president, Mr Bishnu Nisthuri, the Nepal University Teachers Association president, Mr Bhupati Dhakal, and the Civil Society leader, Mr Mahesh Maskey. President of the South Asian Federation of Media Association (SAFMA), Mr Gopal Thapaliya, and president of the Kathmandu Bar Association, Mr Yogendra Adhikari, were seriously injured in the police action. With Indian and Pakistani flags painted on their cheeks, children from 13 schools, aged between six and 12, gathered at Qadhafi stadium in Lahore yesterday to respond to the letter, billed as the world’s largest and titled ‘From India with Love’. The Pakistani children responded with equal enthusiasm signing the golden strip in the letter, now being referred to as the ‘Golden Bridge for Peace’. The children who were overwhelmed by this gesture of Indian students said they favoured peace and harmony between the two nations. “The fundamental policy of China on the question of Dalai Lama is that we demand that the Dalai Lama must acknowledge that Tibet and Taiwan are part of China and seriously and sincerely abandon his pursuit of ‘Tibet independence’ and then we can discuss about his personal future,” Chinese Foreign Ministry spokesman Liu Jianchao said. “The door (for negotiations) remains open,” Mr Liu, also the newly appointed Director-General of the Information Department of the Ministry said when asked about reports about the Dalai Lama expressing his wish to visit China. The Dalai Lama, a Nobel Peace Prize winner, had said recently that he hoped to travel to China on a pilgrimage and to see the changes in the world’s fastest growing nation. “India is looking for an arrangement to barter their sugar for our wheat,” Mr Ashfaque Hasan Khan, an adviser to the Finance Ministry said. “They have not mentioned any quantity but we are considering their proposal. Pakistani farm officials forecast wheat output to reach 22 million tonnes during the 2005/06 (Oct-May) crop year. The annual domestic demand is a little over 20.8 million tonnes. Rengan Murugaiyan, a 35-year-old Indian scaffolding installer, died in the accident. A 35-year-old steel worker from China, Zhang Wei Jun,and a 55-year-old Singapore general worker, Low Chwee Seng, also died in the accident at the PPL Shipyard. Three workers from Bangladesh were also injured in the accident. Meanwhile, Singapore's Shipbuilding and Marine Engineering Employees Union said it was extremely concerned about the safety, well-being and lives of local and foreign workers in the local marine industry.